The Diamondback Line is one of the most beautiful hardtails ever made. 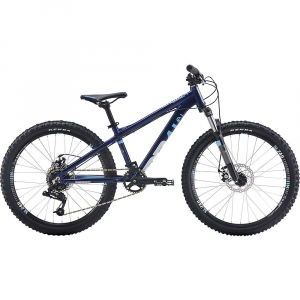 It is built for the terrors and the rough days spent on mountain trails, and is perfect for the complete beginner in the field of trail riding. It comes in a variety of frame sizes, and is pretty great overall. The Diamondback Line is a hardtail bike that we really wanted to enjoy. The frame was made out of 6065 Aluminum, which made it affordable and durable at the same time. It also sported a fork with 120mm of travel, which isn’t a whole lot but is more than enough for beginner trails and slopes. When we took it out on the trails, we noticed that it was, above all else, efficient. The power transmission paired with the aggressiveness of the geometry made for a beginner MTB that was handling like a pro bike in a far higher price bracket. This was also in conjunction with the pretty basic component set such as a 9 speed SRAM drivetrain, which we found to be a lot more reliable than some high end components. In addition to this, the brakes were pretty responsive as well, allowing for more safety for the inexperienced riders out there – Tektro Auriga hydraulic brakes performed well. Overall, this was a pretty wonderful entry level trail bike. A great entry level bike made to ease the transition of a new rider into the wonderful world of trail biking. When we reviewed the Diamondback Line, we figured that it would be a good beginner bike. That is exactly what we received. From the basic but efficient components to the awesome handling on less scary trails, this is a bike made for the newbie!